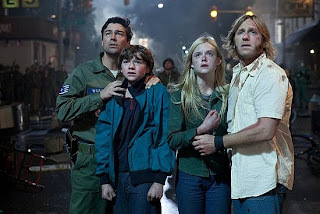 Article first published as Movie Review: Super 8 on Blogcritics. In the summer of 1979, a group of kids film a horror movie for a film festival. While filming a scene of their movie at a train stop, an Air Force train collides with a truck causing a massive accident. In the confusion of the explosions and destruction, something escapes from the train. Now, a small Ohio town begins having strange phenomenon. Animals run away, people are disappearing, and household appliances go on the fritz without warning. The town deputy, Jackson Lamb (Kyle Chandler) investigates as the military begins moving in and covering up. Written and directed by J.J. Abrams (Star Trek, Cloverfield) and produced by Steven Spielberg (E.T., Jaws, Transformers); take you on an adventure in Super 8. The movie was enjoyable and fun with plenty of humorous moments to keep it light hearted and still gave the intense suspenseful scenes. Though I did feel that the movie was trying to reach a happy medium and it didn’t quite get there. Super 8 is filled with many moments of humor amongst the kids and a friendship that felt like a true camaraderie reminiscent of Stand by Me. It was moments like this that felt like the movie was trying to be kid friendly, something akin to Steven Spielberg. I felt this could detract from the more adult audience, as at times it felt like it was a movie made more for the younger ones. Then there were moments of suspense and horror, true to Abrams Cloverfield. This is where Super 8 became confusing, as these scenes were more adult oriented. The action was suspenseful and it seemed like it could be a bit much for a younger crowd. One scene for example where the creature is holding a severed leg seemed to be something that could be too intense. It felt like Abrams was trying to bring the two worlds of E.T. and Cloverfield together, which left it a bit jumbled as to which audience this movie is intended for. The story behind Super 8 was well written and engaging. We are left in suspense, wondering what this creature is, running around town and causing havoc. However in the end, you may find yourself siding with the creature. Unlike most monster movies, there is generally very little explanation as to what it is, why it is and what it is. There tends to be a singular goal of destroying it. However, this is not the case with Super 8. It takes a step away from the norm and eventually reveals everything to you about the creature and its purpose. The young actors do a great job in their roles. Joe Lamb (Joel Courtney) is wrestling with the recent death of his mother. Charles (Riley Giffiths) tries to help Joe by keeping him busy with the movie he is directing; Along with his other friends, Preston (Zach Mills), Martin (Gabriel Basso) and Cary (Ryan Lee) who feels like a young Michael Bay with his infatuation with explosives and fireworks. There is also a love interest they invite along to be in their movie, Alice (Elle Fanning), who does an exceptional job in her role. She is very convincing and shows to have a bright future in acting. Overall the movie was very enjoyable and I think it works well for both an older and younger audience. Some scenes may be a bit intense for younger kids, though a bit of parental guidance should have no problem dealing with it. All in all I would definitely recommend seeing Super 8. It’s a fun film and good for the whole family. Super 8 is in theatres now. It is rated PG-13 for intense sci-fi action, violence and some drug use.